Kalisz 1706 is a strange epilogue to the GNW Saxon Campaign or a prologue to the Russian Campaign. 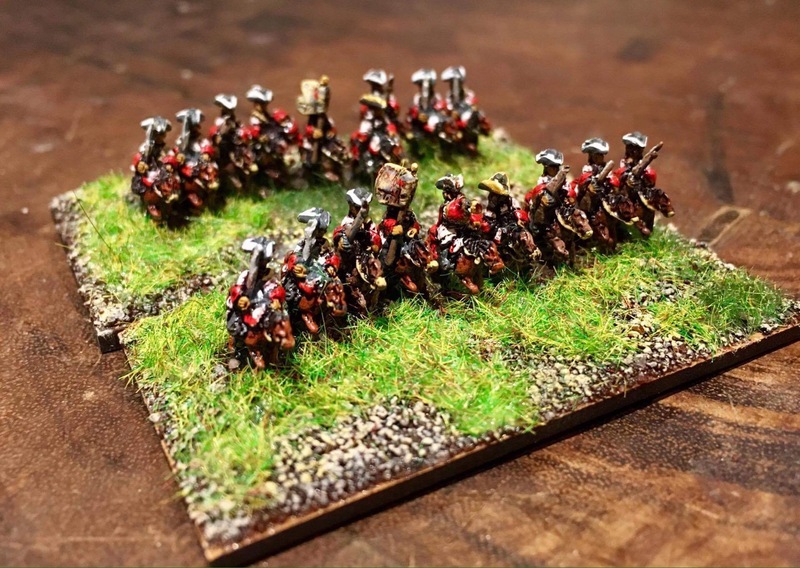 It will field a significant amount of bases with 6mm minatures (close to 200 bases counting leaders and artillery, a total of over 1,700 miniatures). 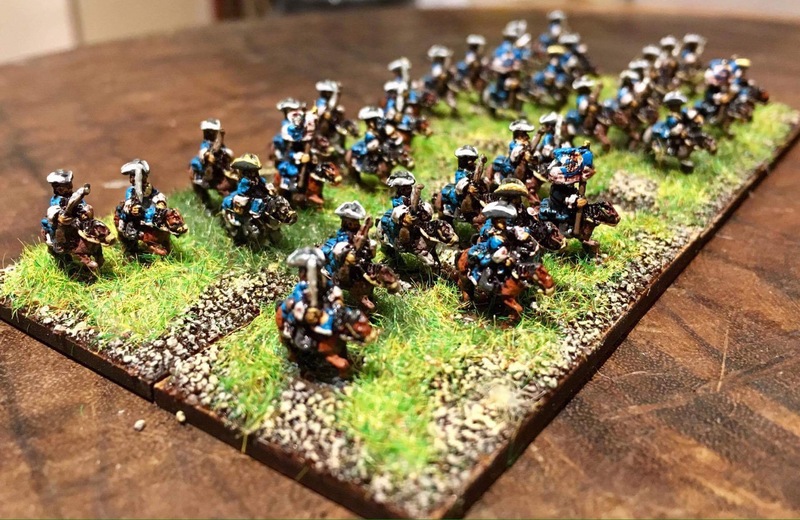 It will have a large amount of Polish Pancerni and Hussars as well as a significant contingent of Russian Cossacks, Kalmucks and Dragoons supporting the Saxon cavalry force. A very small Swedish contingent (in relative terms) with an infantry section consisting of a large portion of prisoners of war from the Fraustadt Battle and with very few indelta regiments overall, supported by a Polish-Lithuanian contingent that historically were eager to fight but withdrew after the first enemy push. Augustus the Strong (Electorate of Saxony) had agreed to a peace treaty with the Swedes following the decisive victory at Fraustadt 1706 followed by the Swedish crown army invading Saxony. But Augustus did not tell his Russian ally and instead tried to get the Swedish General Mardefelt to retreat to save his own face. The Battle was therefore unnecessary and considering an estimated 5,000 men died in the process it seems pointless. The battle includes a lot of different fighting forces – Saxons, Russians, Swedish-Finnish, 2 Polish contingents (one on each side), Lithuanians, Kalmucks and Cossacks. It creates a very “colourful” table. The Poles on the Swedish side fled the battle on the enemy side advancing although they had given assurances they would stay and fight to the last drop of blood. The Poles, whose country had been torn apart by the war, were perhaps not as motivated as those famous winged hussars who saved the day in Vienna 1683 or invigorated by the warrior spirit like the Polish soldiers who held back the Wehrmacht for 3 days at the Battle of Wizna 1939, when they were fighting 40-1 (Which incidentally is one of the best early Sabaton songs, you can find here), neither did they show the prowess nor resolve of the brave Poles of the No. 303 Polish Fighter Squadron that fought the Germans in the Battle of Britain 1940. There is no question about the quality of the Polish soldier throughout history – however during this conflict their heart was certainly not in it. I presented this battle with Nick Dorrell and his merry men from the Wyre Forest Wargames Club at the Joy of Six in 2014. We applied to run it at Salute in 2017 and we got the acceptance letter this week. The Battle will be presented on a 8 by 4 feet table and there will be a lot of bases on it. Models by Baccus from the GNW codes apart from the Kalmucks that are made from the ancient/ rome’s enemies Hun range. Salute, as you may know, is the biggest wargames show in the UK (you can read all about it here) and we have been “showing off” before as I and Nick presented a table with the Fraustadt 1706 battle in 2014. So if you are going there come and say hello. We will be presenting this as a Polemos (GNW)/Twilight of the Sun King Battle. I will provide some more detailed photos of the various elements after I have found them and dusted them off. For the first part of the TMT, the Lesnaya 1708 battle, I need a large number of bases to represent the Swedish Supply column. I had seen the picture above in Pavel Konovaltjuks and Einar Lyths book “Vägen till Poltava” (The Road to Poltava) and wanted to have something similar for my Supply Column. I opted for Baccus ox wagons (from their equipment range). I felt these were a close enough match. However they do not come with a canopy and I did not want to miss a chance to see a splendid row of blue and yellow waggons. I had to do some sculpting and it was not too difficult to do a canopy, but I needed another 39! So I bought myself some Mould Making Silicone Putty from ebay and made a mould from my first creation. It cost me £6 and was very easy to do and very satisfying. I cast them using dental plaster – I made three moulds to speed up production. I have ordered enough waggons from Baccus that are yet to arrive but I already had a few so I did a few test bases today – one waggon and two towed artillery pieces (one Field and one Siege gun and some limbers, again from the Baccus range). I think they turned out ok. Note to self (as I will paint more of these) on colours used. The last few years we have spent Remembrance Sunday at our local Rugby club where the Little One plays. This Sunday was joint practice with the other local, and rival, club. But local rivalries were set aside and the children had a very good training session and what made my day was them standing shoulder to shoulder in remembrance! Rugby is a beautiful sport on and off the field and this day was a very strong manifestation supporting this. We, I and the other Ones, also had some time to re-visit Chislehurst caves, on Saturday, that played a key role during WW2 as an air raid shelter and at its peak it had in excess of 15,000 people staying here over night. Interesting place and this is as close to Dungeons and Dragons you get but with no encounters – incidentally there is a live action roleplaying company running some stuff next door if that is your cup or tea – or perhaps pint of mead (they are called Labyrinthe, and here is a link. I think you have to pre-book). The caves are actually hand dug chalk and flint mines and have since been used to store explosives, grow mushrooms, host pop and rock concerts and as a backdrop for some movies and television series like Doctor Who. As with all of these kind of places there are stories of ghosts and mysterious events in the tunnels – it is worth a visit! I finalized some more Norwegians from the Great Northern War era – this time some infantry. Please see my previous post (last week here) for flag sheets, etc. I have decided to put this diversion on hold for a while and crack on with the main GNW project – but here are the bases I did get on with. Trondhjemske – this regiment was over 2000 men strong so I made it 4 bases. The nice company colours really stands out and make the unit look really good. The white flag represents the Colonels (the head of the regiment) battalion. Gyldenløves Geworbne – this regiment was 2 battalions strong so I made it 2 bases. Hausmanns Geworbne – same as above. Colours of the flags are speculative (I made it up!). We were blessed with the presence of Amon Amarth in London on Friday last week as part of their Jomsviking European Tour – it was a very good show and awoke those old Scandinavian rhythms inside. We, I and the Beautiful One, missed the first support band but managed to see most of Testament – a band from my youth who sounded as good as ever! – it was a fantastic evening. Thank you Amon Amarth! Johan Hegg is a bloody brilliant front man for an impressively tight and talented band. A while ago I re-read the eminent “Notes on the Norwegian Army 1700-1720” by Daniel A. Schorr and got inspired to do a few bases of Norwegian cavalry and infantry [the booklet, in PDF form, used to be available on-line in the past but I can not located it anymore]. 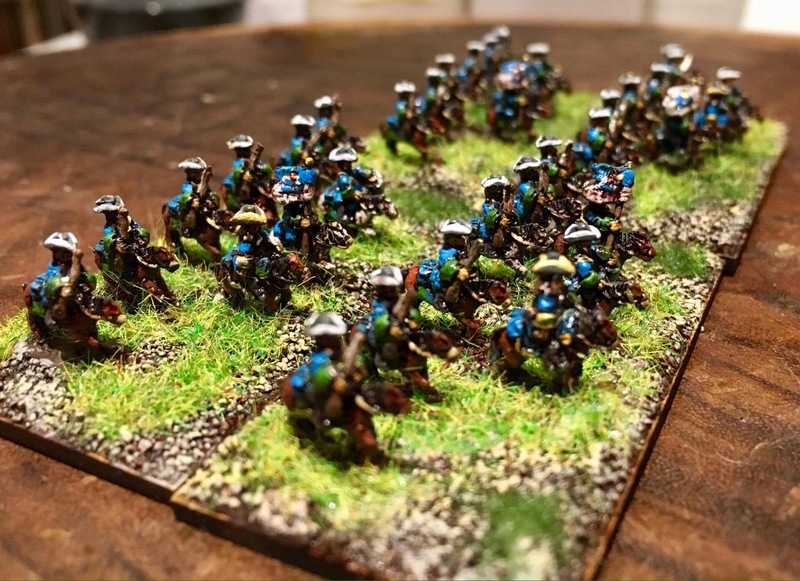 I got about halfway in painting a fair few bases of dragoons and infantry a few months back so I thought it was time to get these finalised and completed a few of the bases. I used Baccus Russian GNW Dragoons for these mixed with a few WSS cavalry (not the latest re-sculpts). These are suppose to represent the units at around 1701. In addition to the Schorr piece I used “Tacitus” eminent page on Norwegian units as a painting guide (you can find it here). Notes from his page are included in italics below. 1701 The national [skrevne] companies had blue coats with lining and trimming in white, and the enlisted [geworbne] companies had blue coats with lining and trimming in green. [I painted the saddle details etc. in blue with white/green trim]. 1701 The regiment would continue to wear light grey coats with red lining after the reorganization to dragoons. [I painted the saddle details etc. in red with white trim. The regiment was re-organized in 1701 but I base them as if they were normal horse]. This week I will finish some of the infantry and tidy up these a little bit. Yes I know I ought to work on the big TMT project but I just needed to get these out of the way. I am tempted to do some dismounted dragoon bases as well to complement these – but let us get some overall progress on the other stuff first. Here is a painting guide for Norwegian Infantry with some colours to use as well. I do the flags about 8mm high for my 6mm miniatures. Cut them out and stick them together with PVA glue around the flagpole, add some paint when dry if required – I suppose you know the drill. Painting Guide for infantry with Colours. If you fail to use these for your purposes get in touch and I send you some better files.